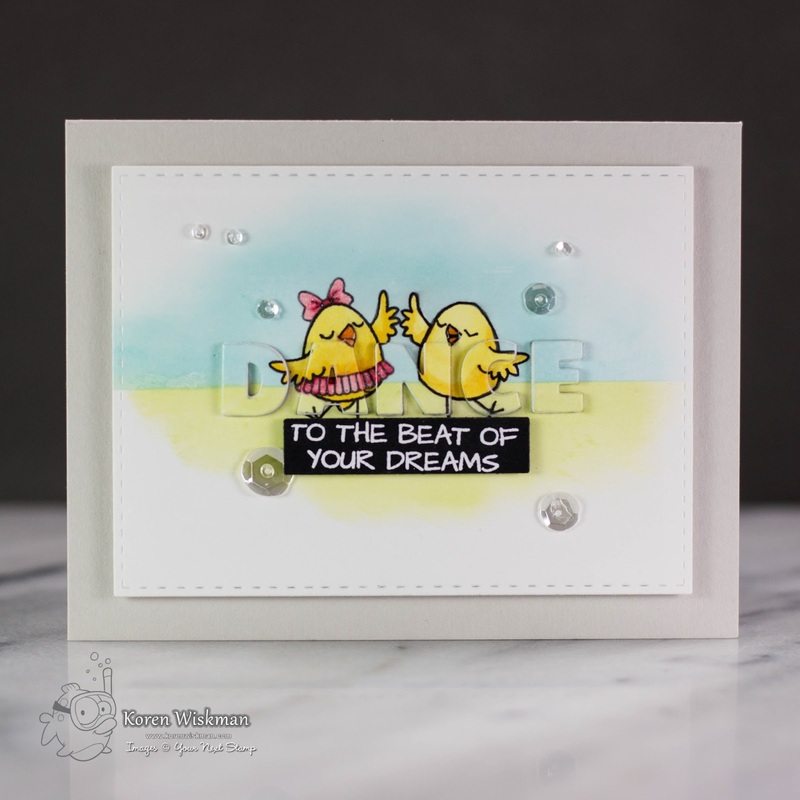 Today I am sharing a card I made for Your Next Stamp Feature Day. We were told to make something around the theme "Magical". This was actually a struggle for me. I finally came up with the idea to use some "Magical" card making techniques to create my card. To check out what the rest of the design team created (CLICK HERE!) to visit the Your Next Stamp Blog. 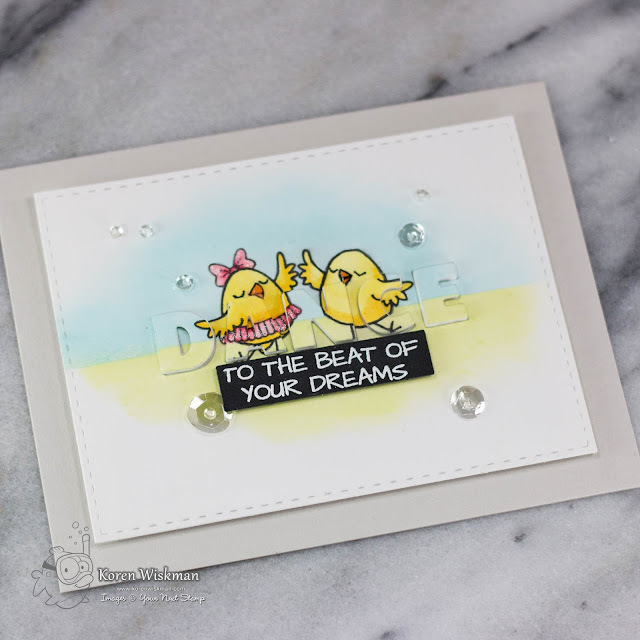 Comment on the Your Next Stamp blog for your chance to win a stamp set of your choice. I started with a piece of Neenah Solar White 80lb. cardstock. I used my Cricut Bright Pad and the packaging the the Hobby Chicks stamp set comes in to trace my "guy" birdie. I took the girl image and traced only the parts that would make my "guy" face her when stamp beside him and look like a boy, not a girl. I first traced it with a drawing pencil and then I went over it with a Copic Multi liner. I then stamped the girl version like normal right next to him in Your Next Stamp Black Olive Ink. I then masked the images with the Molotow Masking Pen. I also masked off the ground and sky with masking paper tape in order to ink blend my background. I used Versamagic Sea Breeze and Key Lime for the ground and sky. The entire panel was cut down with the second to largest Your Next Stamp Stitched Rectangle Die. Once the image and background were completed. I used the Cricut Bright Pad and a cutting mat to line up my Your Next Stamp Bold Alpha dies to cut out DANCE from my image. I also cut out DANCE from white craft foam. SAVE ALL YOUR pieces. The video linked below will show this technique in greater detail. I then used typing paper to create a backing to my letters. Cover it with adhesive and stick it to the back of the card panel. Use the adhesive to stick down first your craft foam letters and then your card stock letters. I stamped the sub sentiment with Versamark Ink and white heat embossed it with Hero Arts Ultra fine white embossing powder. The panel was attached to a piece of white craft foam and popped up on the Simon Says Stamp Fog card base with 1/2" scor tape. The sub sentiment was popped up with 3M foam tape. To finish off the card, I added Pretty Pink Posh Sparkling Clear Sequins and Spectrum Noir Clear Glitter pen to her bow and tutu. I also added glossy accents to both of their beaks. For photos of my card, a link to the YouTube video I made creating this card, and links to all the supplies used to make it, look below. Don't forget to check out the rest of the design team's projects over at The Your Next Stamp Blog (CLICK HERE!) and comment over there to have a chance to win a stamp set of your choice.